Mehdi/Messiah Foundation International and its sister organisation, Kalki Avatar Foundation, are interfaith, non-religious, spiritual organisations. 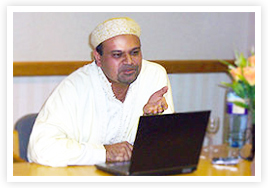 Previously known as RAGS International (founded by His Divine Eminence Ra Riaz Gohar Shahi in 1980), MFI was formally established in 2002 by His Holiness Younus AlGohar under the guidance of His Divine Eminence . Our organisation comprises people belonging to various religions and faiths. The common interest between the assorted members is the bond of divine love and miraculous Doctrine of His Divine Eminence Lord Ra Riaz Gohar Shahi, which transcends all religious and cultural boundaries. Under the umbrella and discipline of MFI, people from all backgrounds strive to bring about widespread divine love and global peace!! Today as the world suffers from the plague of terrorism at the hands of Islamists, MFI appears to be a cool breeze; a candle of love amid stormy hatred and a torch of spirituality in the wilderness of materialism. It does not surprise us when people become puzzled to see our members propagating divine love, respecting humanity, embracing the Jews, the Muslims, the Christians, the Hindus, the Sikhs and all other religions to be their spiritual brethren - but that is the Miraculous Goharian Doctrine. MFI takes guidance from the doctrine of His Divine Eminence Ra Riaz Gohar Shahi. We preach and practise divine love, as His Divine Eminence has prescribed divine love for all humanity. MFI does not associate itself with any religion; however, MFI respects all religions and all divinely ordained scriptures.